Subspecies: There are five subspecies of North American wild turkey: Eastern, Osceola, Rio Grande, Merriam’s, and Gould’s. Size and weight: The wild turkey is the heaviest member of the Galliformes order. The male typically weighs between 11 to 24 pounds and is 39-49 inches long. The female, significantly smaller than the male, weighs 5 to 12 pounds and is only 30 to 37 inches long. Despite their size, wild turkeys can run at speeds up to 25 mph and fly up to 55 mph. Spurs: Bony spikes on the back of each of the turkey’s lower leg. The male will use his spurs to spar with other males. Wattle: A flap of skin under the turkey’s chin. 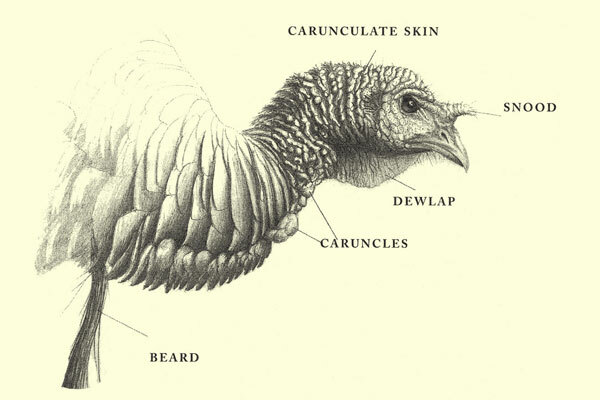 Caruncles: Fleshy bumps that grow on the turkey’s head and throat. Snood: A fleshy flap that hangs from the beak. While both the male and female have spurs, wattles, caruncles, and snoods, they are far smaller and less distinctive on the female. Diet: The wild turkey is an omnivore. It feeds on acorns, nuts, seeds, berries as well as small amphibians and reptiles. Geography: The wild turkey is native to North America, and is primarily found in eastern and central areas of the United States. Habitat: Open woodland, savanna; also, grasslands and swamps. Breeding and Social Structure: The male is polygamous, mating with several female hens during each mating season. To attract a female, the male displays—puffing out his feathers, spreading his tail, and dragging his wings. This behavior is commonly referred to as strutting. After breeding, the female typically lays approximately 12 eggs over a two-week period, though larger clutches of eggs have been observed. Nests are shallow dirt depressions surrounded by vegetation. The female will incubate her eggs for about 28 days. Risks: The wild turkey is currently listed as “Least Concern” by the IUCN. At the beginning of the 20th century wild turkey populations were decreasing due to hunting and habitat loss. But beginning in the 1940s, efforts to save the species have helped populations rebound considerably. In the early 1900s populations were estimated at 30,000. Current numbers of wild turkeys are estimated at 7 million. European explorers took wild turkeys to Europe from Mexico in the early 1500s. They were domesticated there and were later brought back to North America by English colonists. These domesticated turkeys have white-tipped tails while wild turkeys have dark-tipped tails. When Europeans first encountered the wild turkey, it was incorrectly classified as a type of guinea fowl, also known as turkey fowl. The turkey is one of only two domesticated birds originating in the New World. The other is the Muscovy duck. The wild turkey is an agile flier, unlike its domesticated counterpart. When excited, the male’s head and neck coloration changes, alternating between shades of reds, whites, and blues. The wild turkey can make at least 30 different calls. In the spring, the adult male makes a call known as a gobble to attract females. Humans can hear gobbles from a mile away. 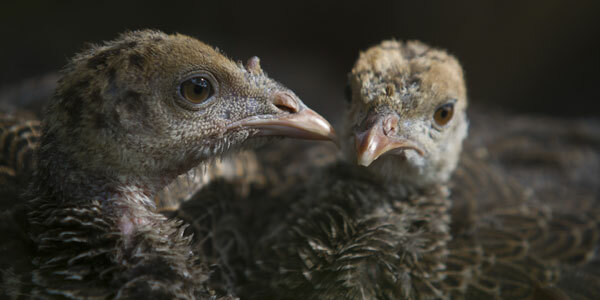 The male turkey is often referred to as a tom and a female is called a hen. Illustration © Joe Hutto. Used by permission of the publisher, Lyons Press.